The feather locks hair extensions Dubai’s Kozma & Kozma offers are a beautiful, fast, fabulous way to add a unique little something to your hair. 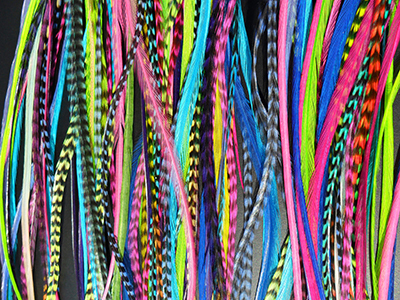 These special hair extensions are actual feathers available in an array of colors. We use a premium quality brand of feather, which is absolutely cruelty-free. We also use silicone bead technology that does not damage hair. Feather locks are durable against different kinds of styling. They can be washed, dried, flat ironed or curled. They are available in lengths 8-16 inches and we can cut them just like hair.